Laugh: Because Ha-Ha Leads To A-Ha! If you’re trying to come up with an idea or solve a problem, think funny. 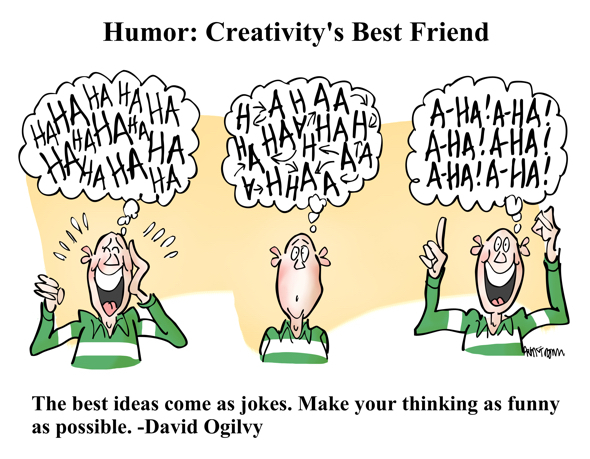 Jokes and humor help us relax and look at things from a new angle so our minds can make creative leaps. Surprise is at the heart of comedy. Surprise is also at the heart of creativity. Creativity is about more than just producing something. It’s about producing something in a new way, a different way, a surprising way.